William S. Burroughs has shown generations of readers that the written word can provide experiences they'd never before imagined. But to get to Burroughs' written words, most of those readers have entered through his covers---or rather, through the covers that a host of publishers, all over the world and for over sixty years now---have considered sufficiently appealing representations of Burroughs' daring, experimental, and not-especially-representable literary work. You can see over 500 of these efforts at the Burroughs page of beatbookcovers.com. 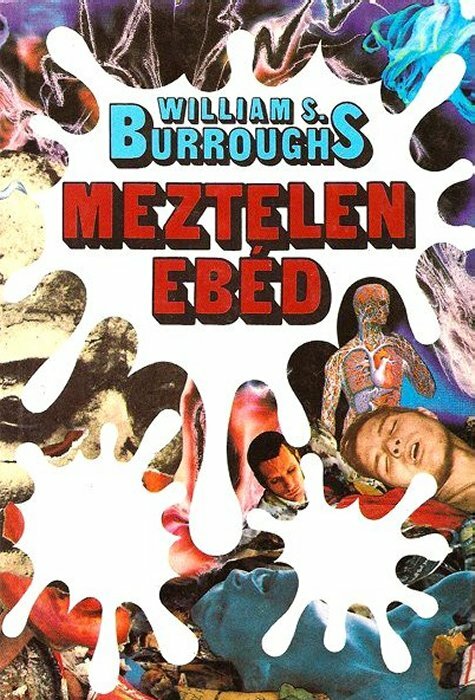 As mild-mannered as he could seem in person, Burroughs' life and work, what with the drugs, the acquaintance with the homosexual underworld, and the reckless gunplay, has always attracted an air of the sordid and sensational. Publishers didn't hesitate to exploit that, as we can see in the first edition of Burroughs' first published work Junkie just above. 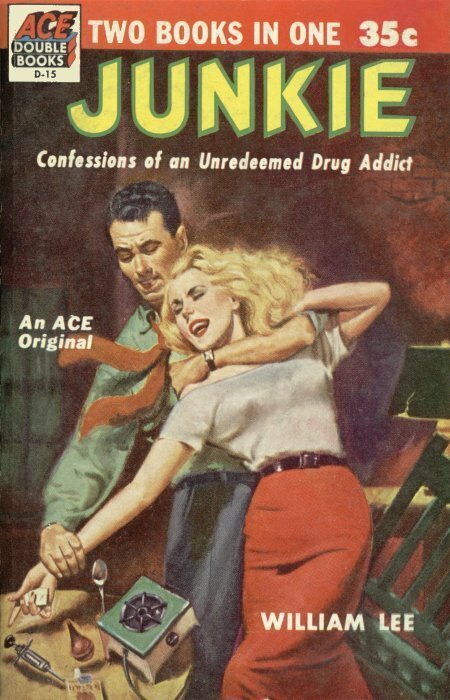 Not only did it come out as a 35-cent mass-market two-in-one paperback, it promised the "confessions of an unredeemed drug addict," and with that lurid illustration implied so much more besides. No matter how much readerly curiosity it piqued, how much of an artistic future could someone impulse-buying it at the drugstore have imagined for this "William Lee" fellow? 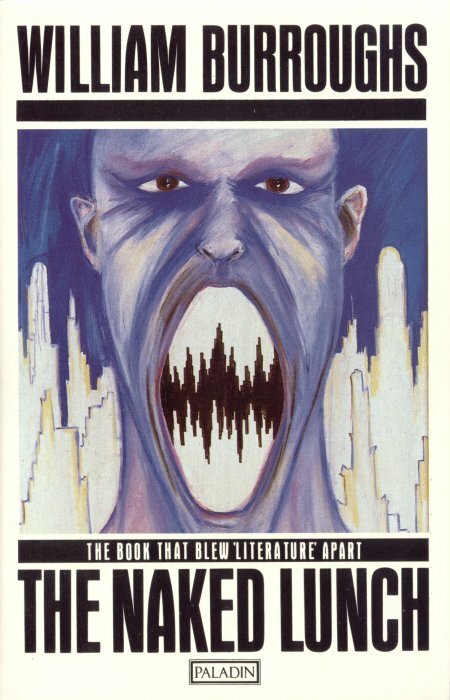 More curious readers have probably become Burroughs fans by picking up The Naked Lunch, his best-known novel but a more controversial and much less conventionally composed one than Junkie. This story of William Lee (now just the name of the protagonist, not an authorial pseudonym) and his substance-fueled odyssey through America, Mexico, Morocco, the fictional Annexia and far beyond has had many and varied visual representations, all of which try to convey how strenuously the text struggles against the strictures of traditional forms of writing. Sometimes, as in the 1986 U.K. edition from Paladin above, they resort to telling rather than just showing you that you hold in your hands "the book that blew 'literature' apart." Those of us who get deep into Burroughs' work often do so because it transcends genre. Still, that hasn't stopped marketing departments from trying to place him in one genre or another, or at least to sell certain of his books as if they belonged in one genre or another. The "Nova trilogy" with which Burroughs followed up Naked Lunch, has tended to appear on the science-fiction shelves of bookstores around the world, not completely without reason. 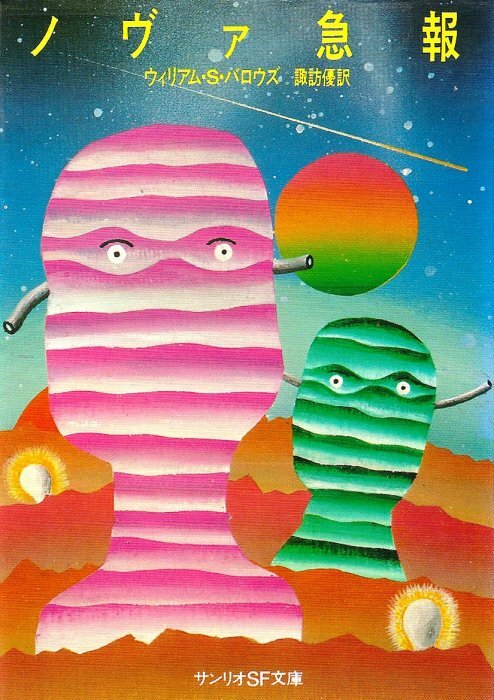 Still, the sensibilities of the sci-fi world and Burroughs' mind do clash somewhat, producing such intriguing results as the 1978 Japanese edition of Nova Express above. 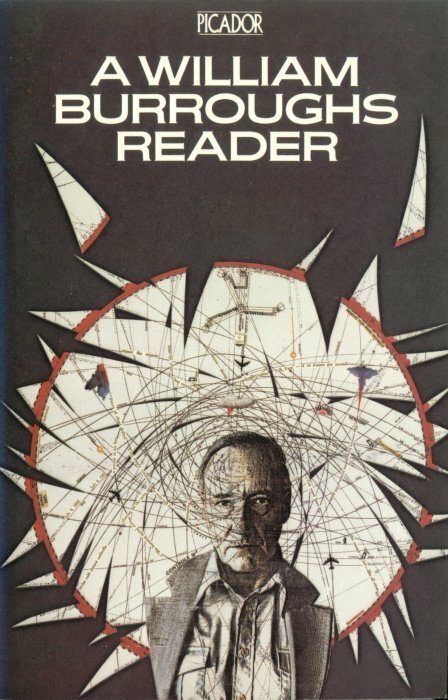 Ultimately, the only image that reliably conveys the work of William S. Burroughs is the image of William S. Burroughs, which appears on the cover of this 1982 Picador William Burroughs Reader as well as many other books besides. As anyone who's gone deep into his bibliography knows, the work and the man don't come separately, but they'll surely always remember the cover that led them into his world in the first place, whether it bore images subdued or sensationalistic, a design grimly real or forbiddingly abstract, or a proper warning about just what it was they were getting into.